Eyeliner can be applied in many styles and colors, from soft, natural-looking lash enhancement to a defined line–the choice is yours! 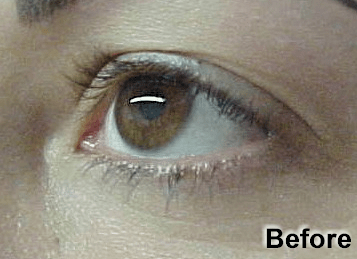 Some people feel both upper and lower eyeliner suits their needs best, while others feel only an upper or a lower eyeliner is appropriate for them. Whatever look you choose, you will wake up, shower, exercise, work, swim, and go to bed always looking your best. No more tattle tale eyeliner smear or smudge during the day, no more concern when participating in sports activities and best, your appearance remains consistently fresh appearing throughout the day and night. The actual cosmetic eyeliner process varies inasmuch as there are numerous devices that prevent cross contamination that the permanent cosmetic professional may use. The choices are the coil machine, the linear device (the Neo Tat) the digital rotaries, the permanent cosmetic pen rotaries and the manual device. All, when used in accordance with Occupational Safety and Health Administration (OSHA) Bloodborne Pathogens guidelines, are safe. You may ask to see the attendance certificate indicating your technician has attended an OSHA Bloodborne Pathogens class. If there is permit, registration, or licensing required in your state, you should also look for the appropriate documents, which are required to be posted in plain sight, to ensure the cosmetic tattoo artist is compliant with state and local laws. The process – Some technicians will use a pre-procedure anesthetic, some do not. If a pre-procedure anesthetic is used and the technician is not a physician or working under the direction of a physician, it will be an over-the-counter (OTC) level anesthetic which has proved to be quite effective. If you are working with an SPCP member technician, the anesthetic is likely to be provided by an SPCP supplier member who ensures anesthetic OTC contents levels are well within the limits of the law. The same applies to anesthetics used during the permanent eyeliner procedure. The work table will be assembled with one-time-use accessories. If a pre-procedure anesthetic was applied, it is removed in a timely manner in accordance with manufacturer instructions, a sterilized needle will be opened, the needle assembled into the device and the procedure begins.